Forget Bora…there is a new paradise hidden and best kept secret…the Camiguin Island.A paradise unspoilt..clean white sand beaches..tropical fruits..panoramic views..safe..beautiful and amazingly heaven in holiday time. Camiguin is a small island province of the Philippines off the northern coast of Mindanao. It belongs to the Northern Mindanao region. Its capital is Mambajao and it is the second-smallest province both in population and land area. 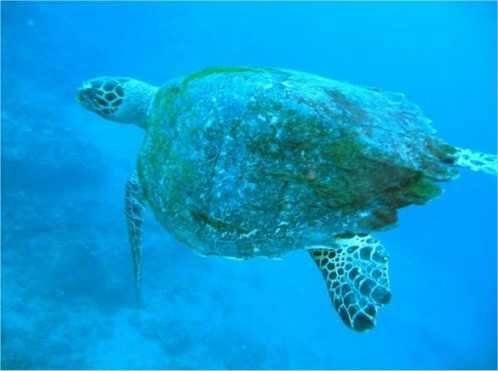 The island of Camiguin is in the Bohol Sea about ten kilometers north of Misamis Oriental. The name Camiguin is derived from the native word “Kamagong”, a tree of the Ebony family that thrives near lake Mainit in the Province of Surigao del Norte. The original inhabitants of Camiguin were “manobos” who migrated from Surigao. The old native language in Camiguin is called “Kinamiguin”, which is similar to the dialect spoken in Surigao. Sagay Church facadeSeveral centuries-old churches are found in various parts of the island. One of the famous churches is the Sto. Rosario Church in the municipality of Sagay built in 1882, and the church ruins of San Roque in Barangay Bonbon. Another famous church located in Baylao is said to be miraculous during the volcanic eruption and claimed to have saved many lives. Camiguin Island is famous for the ancestral homes dotting the streets all over the island. Each year there is a Lanzones (a small grape-sized tropical fruit) Festival held in October. 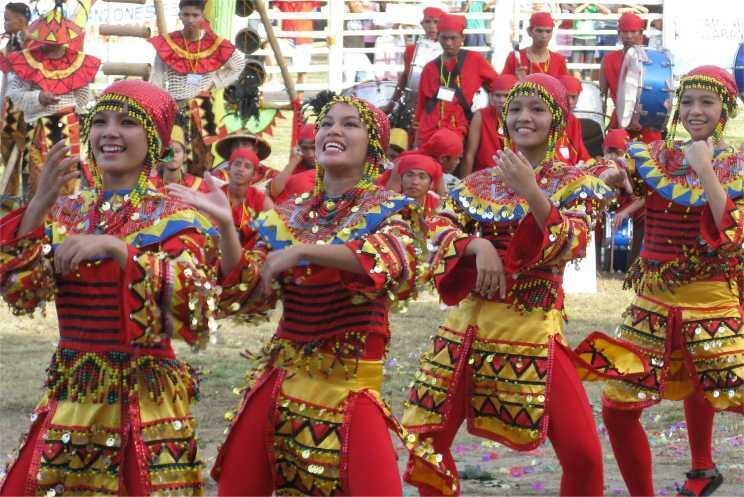 The week-long festival is one of the more colorful events in the Philippines. The Lanzones festival celebrated its 30th Anniversary last October 2009. 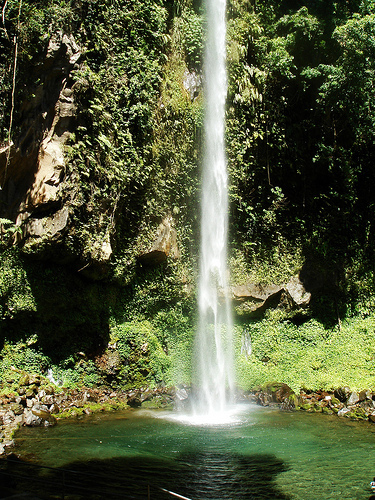 The stunning Katibawasan Falls and hiking trails to thrill your senses The spectacular 250-foot falls (76 m.) cascades down to a pool surrounded by orchids and ferns. Located 4 kms. from Mambajao. This is also the favorite jump-off point for trekkers and mountaineers in search of adventure in the slopes of Mt. Hibok-Hibok. In the heart of the island bubbles the flowing mineral pools of Ardent Hot Springs. Mists rise from the heated waters running down from the vents of Hibok-Hibok Volcano, the only active one among the seven on the island. There are also a couple cold springs and a natural soda water spring on the island. 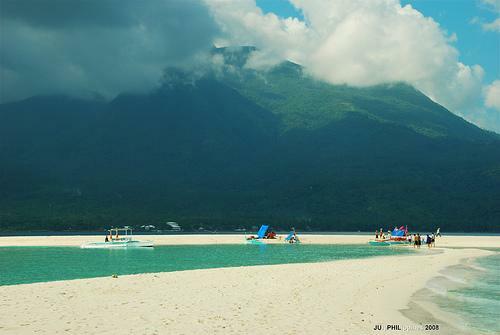 Camiguin is accessible by air and sea from Cebu City however flights into the province’s only airport is only seasonal. Most fly in to Cagayan de Oro City in Misamis Oriental Province, the gateway to Northern Mindanao. One would then take 2 more or less hours bus or hired van from Cagayan de Oro City to the port of Balingoan. 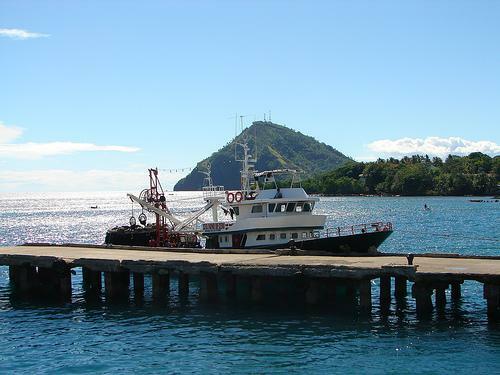 Ferries leave Balingoan to Camiguin Island every hour from 6:00 am until 5:00 pm. 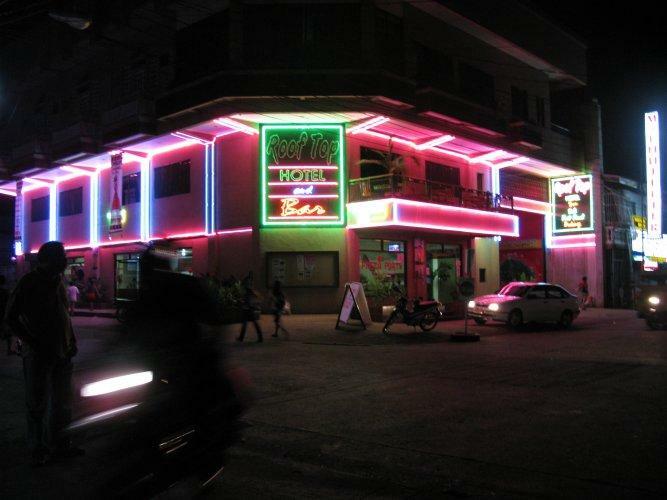 Highly recommended HOTEL away from home is the ROOFTOP HOTEL in downtown Mambajao in the island. Very warm and accommodating manager and owner with all emplyees ever smiling and ready to serve you…with much indulgence. The price for the rooms are reasonable.The new owners made new refurbishments and made modern interiors in the lobby down to the de luxe rooms and bathrooms.They have a fantastic restaurant and serves all the freshest produce from the sea…either hot grilled or fresh like sushi…you just say it ,,they’ll make it for you…!!! serve are the bountiful sweet fruits from the highlands,whic made Camiguin Island famous for. Book in advance and surely it would be the most unforgettable trip/holiday in a lifetime…do come back to the paradise hidden…the CAMIGUIN ISLAND. Very nice shot of the pristine beach. Can I have your permission to place on my website someday?